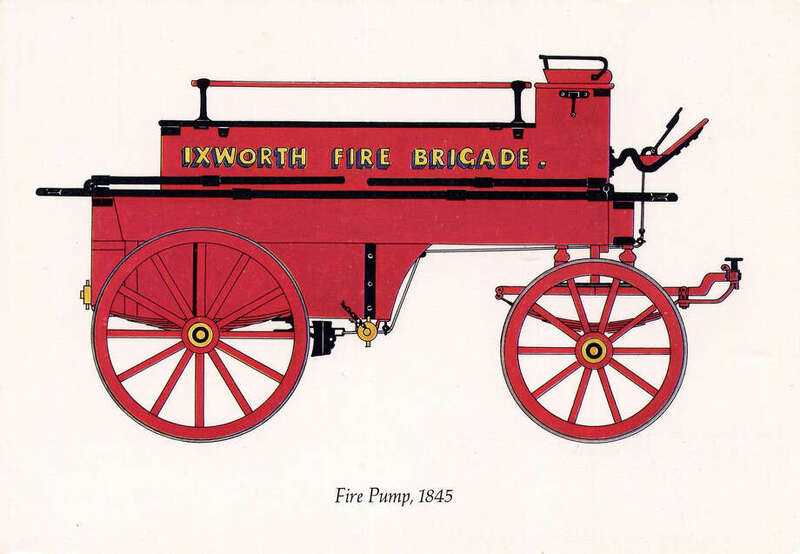 Fire vehicles from the mid-1800s looked like this rendering of a wagon with wooden wheels. In July of 1845 New Canaan bought its first such truck and formed a fire brigade. In July of 1845, New Canaan purchased its first fire engine and a volunteer department was formed. The history of New Canaan Fire Company, No. 1 can be traced as far back as 1845, if not beyond, when informal bucket brigades were first organized in town, according to the current fire department’s website. The town’s fire service has evolved over the years into an organized, formalized public safety department featuring both volunteer and full-time paid staff. After a local newspaper called for better fire protection in 1869, the original Hook and Ladder Company was formed, which in 1873, lead to the formation of Quinnipiac Hook and Ladder Company No. 3, the precursor to the modern New Canaan Fire Company. The Fire Company as it exists today was chartered on Dec. 8, 1881, and New Canaan Hook and Ladder Company and Fire Engine Company No. 1, was incorporated by the Connecticut Legislature in 1885, according to the fire department’s website. The original firehouse was erected on Forest Street and was paid for with a $500 loan. In 1891 a two-story firehouse was erected on Railroad Avenue, now known as Elm Street. In 1938, the current firehouse was constructed at the intersection of Main Street and Locust Avenue. The building has been renovated over the years to meet the needs of the firefighters, and included a large addition that doubled the space for fire apparatus, constructed in 1965. Firefighters were once summoned to the firehouse by a bell, which was replaced by a large horn installed in the tower on top of the firehouse. The fire horn is still prepared for use in the event normal means of dispatching fire units are offline. New Canaan’s first fire engine was a Gulf Stream Hand Pumper, purchased from the City of Stamford for $400. Stevens Livery Stable provided the horses to pull the pumper. That pumper was traded in for a truss ladder capable of pumping 300 gallons per minute — an astounding feat in those days. In 1912, Mr. A. H. Mulliken donated a combination hose and motorized fire truck. On its first alarm, this truck had difficulty leaving the firehouse due to the number of firemen who climbed aboard.